Wow. 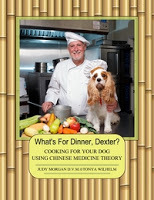 It’s hard to believe that Dexter The Dog turns 7 today. It seems like just yesterday that the family was sitting in front of my computer screen looking at Dexter’s puppy photos and counting down the days until he came home. D-Day, as we called it. We saw puppy photos for a month, then met the puppies at 5 weeks and Dexter chose us. Literally. You can see in this video that when I walked away, Dexter followed me! But we had to wait almost 7 more weeks before bringing him home on December 19, 2009. Wow, what an exciting few months, waiting for Dexter to become part of the family, and a part he became. Dexter became more than a family addition; he became the center of my universe, and I would say a pretty darn important part of the entire household. Now the saying is, “It’s all about Dexter,” and I’m happy about that. There isn’t a day that goes by that I don’t thank Dexter for being my companion and best friend. He truly is my heart dog. 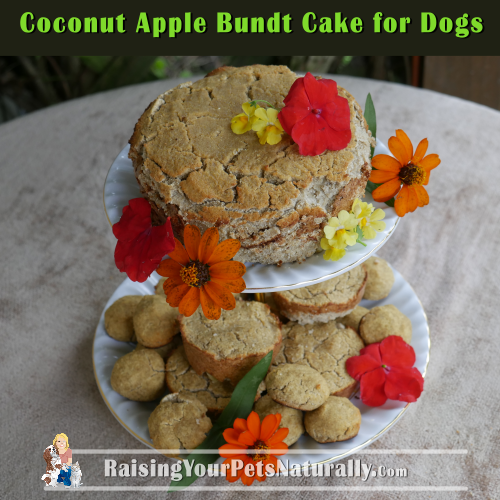 So today, in honor of Dexter’s 7th birthday, I thought I’d share the recipe for his dog birthday cake, a Coconut Apple Bundt Cake. 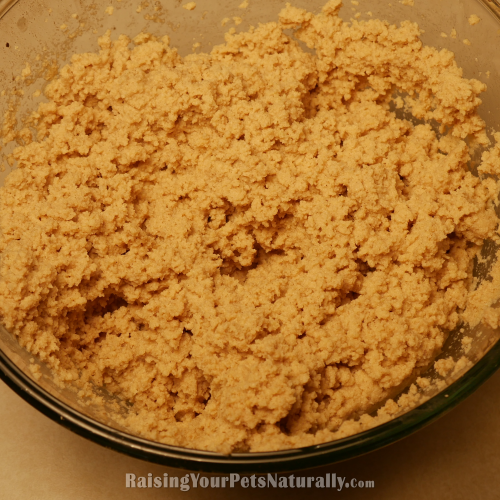 It’s a pretty simple dog cake recipe, and he gobbled it up with gusto. Okay, so he sort of gobbles anything up. But it’s still pretty terrific! 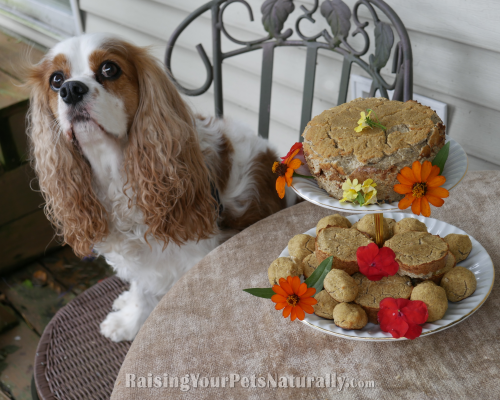 First, a few notes about the healthy dog cake recipe to get you started. First, I never use ingredients such as corn, wheat, or soy. These ingredients do not have any health benefits for our dogs, and are a common source of allergies and inflammation in pets. I used chickpea flour and coconut flour. Chickpeas are high in protein and fiber, and low in calories. They are packed with vitamins and potassium, and support good heart health. Coconut in all its glorious forms is a powerhouse. Coconut can combat yeast, inflammation, and skin infections, and it even helps with digestion. 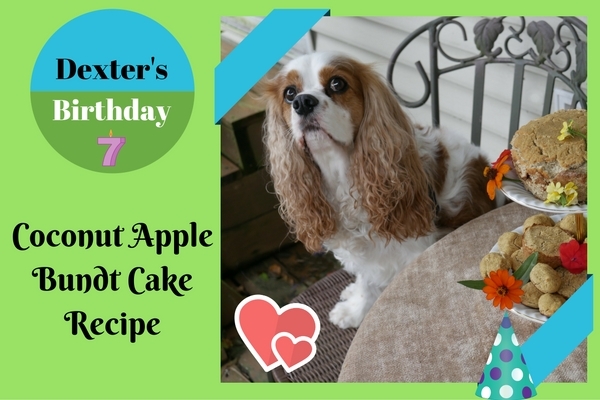 Since October is National Apple Month, I thought apples would make a great flavor choice for this delicious dog birthday cake. I don’t have to tell you, “an apple a day keeps the doctor away.” There is a reason for that quote. Apples are packed with antioxidants and fiber. One of those antioxidants, quercetin, is thought to help reduce cellular death caused by oxidation and inflammation of neurons, and thereby benefits neurological health. That’s some pretty heavy benefits for such a tasty and dog-friendly fruit. So, on to the dog cake recipe! 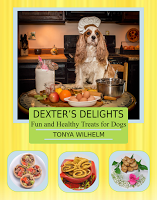 This recipe made Dexter a 6” cake, 6 muffins and 15 treat balls. Enjoy. A healthy and fun dog birthday cake. Crack eggs into a large glass bowl and add the cinnamon and baking powder. Beat on high for one minute and set aside. 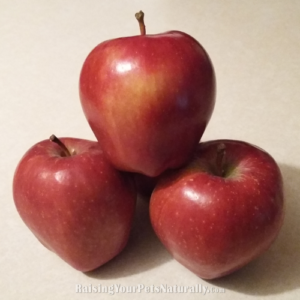 Clean and peel, core, and dice the apples into small pieces. Toss into food processor or blender and add 3 cups of water. Add pureed apples to the egg mixture and incorporate with a spoon. Slowly beat in flour until all the ingredients are blended. The mixture will look grainy, not like a typical cake batter. 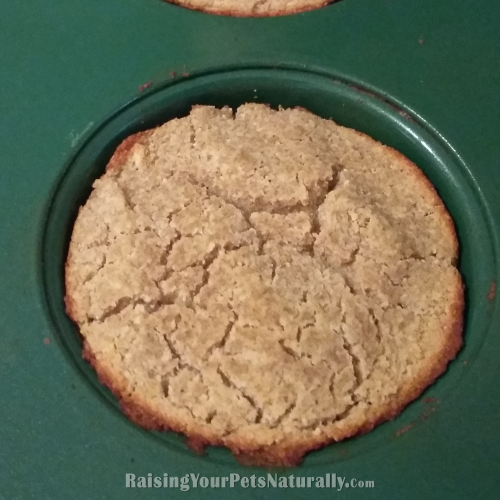 Press mixture into a cake pan or muffin pan of choice, or roll 1” balls and place on a cookie sheet. A ceramic or oiled glass pan works best. Cookies and muffins bake for approximately 30 minutes while a larger cake approximately one hour. A toothpick inserted into the center should come out clean when the cakes are baked. 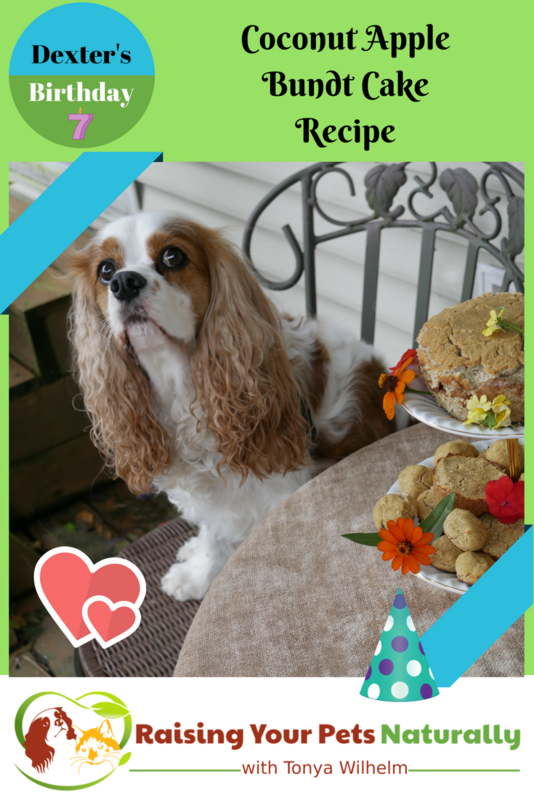 Have you made a birthday cake for your dog? Tell me in the comments. I just spent a good amount of time enjoying some of the video’s from the early beginnings of Dexter days. I’m completely surprised a little red puppy didn’t come home with your mom. 😉 I like how you let Dexter pick you..it is an important part of the process of bringing home a new little one. That’s now our friend, Lambeau. He was scooped up by a trainer in Chicago. So, they have socialized since puppyhood! Can I use just all coconut flour? I’ve never tried. Give it a shot. May turn out too crumbly.